HALIFAX -- In the wake of the revelation of a large breach of information at the military's East Coast intelligence Centre, the navy's commander in the region now says there have been five more breaches of a secure military computer network at Canadian Forces Base Halifax. In an interview requested by the navy on Thursday, Rear Admiral John Newton said the "non-nefarious breaches" occurred at the navy's training school at the base. Newton said they were found after the navy began security scans of its system in September. 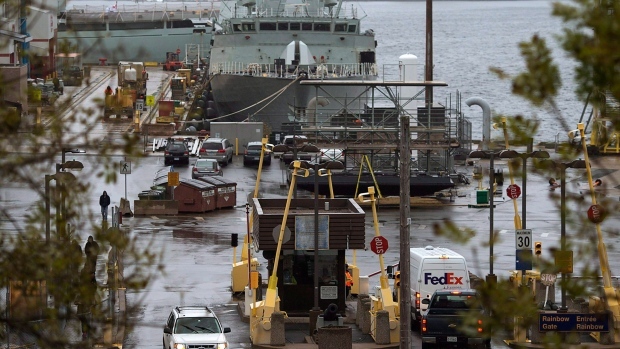 He said those same scans had previously turned up a larger breach of information at the intelligence facility, HMCS Trinity. He said the latest checks revealed an inappropriate use of information by three instructors and two students at the training school who transferred classified training material from the military's classified network to its unclassified network. "Therefore I would suspect that the nature of the material on the military unclassified network now are a small group of files related to training of our sailors and how they operate their ships," said Newton. He said the network scan found that a smaller number of files were involved than in the Trinity case, in which more than 1,000 secret documents were mishandled. "In one of, less than 10 (files) and it's of that nature," Newton said. While he classified the latest misuse as "small indiscretions," Newton said the navy views it as a serious matter. He said military police are investigating and so far, no charges have been laid. The instructors involved have been transferred to an area that doesn't handle secure information, he said, while the students would also face administrative measures pending the outcome of the investigation. Newton said he's confident the incident was contained within the military because he said its computer network is closed to the public and is not part of the Internet. "There is no information I have of anything more serious than dealing with human error. Transgressions of moving stuff from one military network to another military network." He suggested part of the problem may have involved people trying to digest course information in another format because of limited access to restricted computer terminals. Newton said he's committed to reducing the number of incidents he describes as "background noise" in order to see if there are larger problems with the system. "I've got to reduce those to zero so I can see people trying to abuse the networks for nefarious intent," he said. The interview, conducted in Newton's office overlooking the Halifax naval dockyard, followed details of the Trinity breach that emerged on Monday. A search warrant filed in provincial court by military police alleges that between 2004 and 2009 a web designer used Defence Department networks to improperly store secret files. None of the allegations has been proven in court and so far no charges have been laid. A serious breach at Trinity in 2012 led to the arrest of Sub-Lt. Jeffrey Paul Delisle, a navy intelligence officer. Delisle was sentenced to 20 years in prison in February 2013 for copying secret computer files and selling them to Russia.